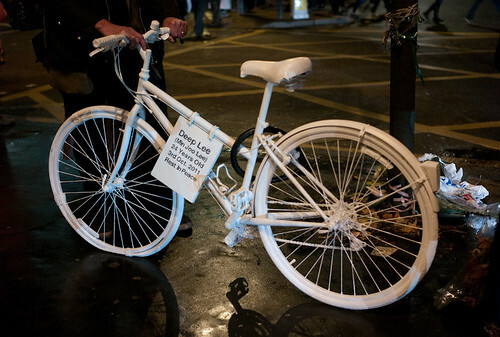 Pictured above it the ghost bike at King’s Cross, installed for Min Joo Lee – called Deep Lee by her friends , 24, who was killed by a lorry on the junction of Euston Road and York Way on 3 October. According to her friends, she was a very experienced cyclist and “always careful and aware”. For years, pedestrian and cycling campaigners have severely criticised the road design around King’s Cross. A 2008 report commissioned by TfL came to the conclusion that the whole area was highly dangerous and should be re-designed. I’ve written several times about the danger in the area – the first post was six months before Deep Lee’s death. A number of cyclists have shared their experiences in comments on this blog. All agree that the area is a complete nightmare for cyclists. I think those views deserve more attention. Hence, I chose to document them in a separate post. And, of course, I’d appreciate if more cyclists shared their views about the road design around King’s Cross. Write in the comments, please, I’ll add it to this post. The entire junction is a deathtrap. Having been forced to use it in 2004 and 2005, when it was on my route to work, I now avoid it whenever possible, and will take a detour of a mile or more to do so. This is after I was nearly crushed by a bendy bus in (I think) 2005; having dismounted to point out to the driver his lack of care, he got out of his cab and shoved and shouted at me. This case was sorted by a complaint to TfL, and the driver was disciplined, but it says something for the atmosphere created by a supremely badly-designed junction, possibly the most aggravating in London. There is not enough space and cyclists are extremely vulnerable to other vehicles, a fact that anyone who has cycled there can see immediately. The fact that it is taking a human toll in terms of deaths for this to attract attention is a sad indictment of TfL’s priorities. I am surprised to read over the last few days about the suppression of the report that was critical of this junction. Let’s hope it won’t take a further tragedy before TfL get off their dots and try to do something about this. Construction traffic [around King’s Cross] is lethal. Whether it is because of the fact that they are paid by the lorry load or whether it is because the drivers are neanderthals or both, means they should not be on the roads at all. They are violent and aggressive drivers and will threaten anyone who dares to question that. Same around the Blackwall Tunnel. That junction [Euston Road/ York Way] is a nightmare, I have the privilege of it using everyday..along Euston Road, then up York Way, skimming along the white line of the bus lane whist trying not to get run over by motorised traffic hearing past at way faster than 30 miles an hour, not indicating etc. Even blasting off from the advanced lights spot, hitting 25-30mph by the time I get to the station trying to get some clearance from traffic is not enough they’ll hurtle past me indicate into York lane without a care for me or other cyclists. With buses pulling out constantly, peds running for trains right across the junction and not looking and with motorised traffic seeming oblivious to all around them, it feels like open season on that road for cyclists. I’ve cycled for many years and cycling around 250-300 miles per week all over London but still, that one part of London road layout still fills me with dread, I know I’m taking my life in my hands every time I use it to get home. it is far too ********** complex to expect people who don’t know that area to be able to avoid going on horrid roads and use alternative quieter roads instead. The cycle path that runs parallel to Euston Road has pretty much no signage to any of the train stations or other destinations along there (or if there is it’s rather hidden). The approaches to this junction [Pancras Road at the junction with Euston Road] have danger practically designed in rather than designed out. Come up Grays Inn Road and a lot of the traffic want to head right to go up York Way whilst traffic coming South from Caledonian Road has to cross to the left to head along Kings Cross(Euston) Road, all in barely 100 metres of a 4-5 lane road (with a wide bus lane that cuts off just before the crucial junction, where this lot is forced down to 2 ‘minimum width’ lanes towards Euston and 2-ish (narrowing to 1) lanes heading up York Way. Going East the big hazard id the short distance in which vehicles normally make their move to turn left into York Way after passing the Kings Cross bus stops. I use this area often when in London, and have often to take the lane and enforce my ‘presence’ which occasionally gets abuse. The left turn in to Pancras Road also presnts a hazard when vehicles excluded by the bus lane/bus stops at St Pancras try to make the left turn from the centre lane. Maintenance of road surfaces adds substantially to the level of hazard, notably heading West, where I either take the entire nearside lane to avoid the holes that would bring me off the bike, or am in the outer lane overtaking and making sure I don’t get trapped in the right turn traffic for Pancras Road. on my first night in London I almost got hit twice by two lorries at this junction [Euston Road / York Way]. its really dangerous. I also cycle through the area every day, up York Way. You’re right – the whole area is a cycling nightmare, due to the road design. Too much congestion, too many lanes. One thing you don’t mention which I’ve noticed over the last year is the rise in construction traffic – there has been a huge increase in number of cement mixers, lorries and other large vehicles. Not sure there’s a fix for that while all the construction work is ongoing, but it’s another reason to look for alternative routes in the meantime. Dangerous driving – who knows this Royal Mail HGV driver? Construction traffic is lethal. Whether it is because of the fact that they are paid by the lorry load or whether it is because the drivers are neanderthals or both, means they should not be on the roads at all. They are violent and aggressive drivers and will threaten anyone who dares to question that. Same around the Blackwall Tunnel. Thanks, I added your view to the post. The entire junction is a deathtrap. Having been forced to use it in 2004 and 2005, when it was on my route to work, I now avoid it whenever possible, and will take a detour of a mile or more to do so. This is after I was nearly crushed by a bendy bus in (I think) 2005; having dismounted to point out to the driver his lack of care, he got out of his cab and shoved and shouted at me. This case was sorted by a complaint to TfL, and the driver was disciplined, but it says something for the atmosphere created by a supremely badly-designed junction, possibly the most aggravating in London. There is not enough space and cyclists are extremely vulnerable to other vehicles, a fact that anyone who has cycled there can see immediately. The fact that it is taking a human toll in terms of deaths for this to attract attention is a sad indictment of TfL’s priorities. Thanks for your comment, I added it to the post. This does seem to be incompetence of a high order. Stuttgart has some dodgy junctions but they aren’t as bad as the london ones judging by my entirely unscientific comparisons using Google. I think the Strict Liability laws here help as well.